A few years ago I was encouraged to set up my classroom Twitter account. Shortly after looking at a few different examples and researching possibilities, I decided to create a class account. During my school’s back to school night I mentioned to the community that they could follow the class on Twitter. I was excited as a few parents followed the class account that evening. Throughout the rest of that year I Tweeted out different happenings of the class. More community members, including those with students not in my class started following our classroom account. The feedback that I was receiving seemed positive so I decided to continue to use the class account for another year. I started this activity back in November. Every week I ask assigned students to create a Tweet that explains what we’ve learned. Students can also mention activities or events that occur. Students write out their Tweet on a separate sheet of paper and I send it out. I find some students find it challenging to write down their thoughts in limited characters. This is a classroom job that students look forward to and I feel like it’s also empowering. In order to better track our classroom happenings, I decided to create a tag for just our particular class. My school doesn’t have a Twitter tag so the class decided to use #sllearns. For the past few months the class has used that tag to document our learning and activities. The tag also comes in handy to compile Tweets and pictures before school events. Students now video record themselves and others using the Vine app. Using the Vine app, students record themselves in different activities in the classroom. This is another assigned job that the students perform. I find video to be a powerful tool in communicating different activities in the class. 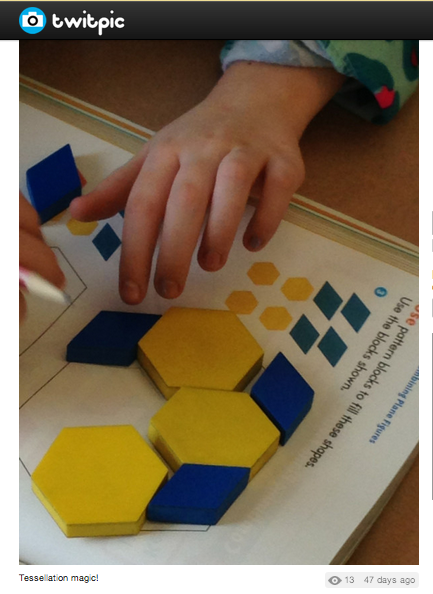 This has been especially helpful when showing math manipulatives and student presentations. You could also use Instagram for this job. This was how I originally started using my classroom Twitter account. I Tweeted out school calendar events and classroom links. My school account still does this, just not as often as last year. It’s been great to be able to connect with other classrooms through Twitter. Our class has connected with other elementary and middle school classes this year. Mystery and Number Skypes have been possible by connecting with other classes through Twitter. Periodically, my class will review happenings of other classroom accounts. I’m hoping to expand this and somehow collaborate with other classrooms on some type of project in the future. 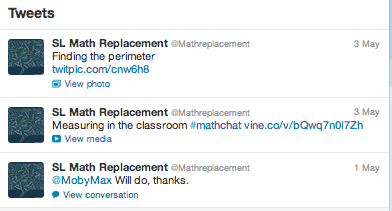 Eventually I’d like to be able to use my classroom Twitter account to answer questions from members of the community. I don’t necessarily think that Twitter should be a one way communication method. This is a work in progress, but I’m hoping to use this more next year. In an effort to increase the visibility of our class Twitter account and to show the value I decided to embed the Twitter stream into my class webpage. This has been beneficial as photos, videos and Tweets can all be viewed directly on the website. The community visits my website so this is an easier way to reach the class Twitter stream. Also, when students write up a Tweet or record a video for the class, they can easily access their production on my class website. How do you use Twitter in your classroom? Parent/teacher communication is key in and outside of the classroom. Educators, no matter what level they teach often communicate with parents through face to face conversations, emails, phone calls, and letters. Generally, elementary teachers type up a weekly/monthly letters to parents informing them of the happenings in the classroom. This letter writeup has been a staple in many classrooms, including mine. Depending on the individual situation, more communication from the school can benefit the school community. Over the past few years new communication methods have started to change the informing landscape. As they should, parents often want to know how their child is progressing and what’s happening in school. Keeping community members informed and aware of classroom happenings can create more clarity and demonstrate the learning that’s happening. This information can also bridge home and school connections. Beyond the classroom monthly letter, pictures and videos can bring memories and school discussions back home to parents. This provides parents with opportunities to discuss events and activities that are happening in the classroom. I feel as though this benefits the parent/teacher/school relationship. I’ve found the three methods below to be valuable in communicating information to the school community. Twitter: Having a classroom Twitter handle has the potential to improve communication with the community. In an effort to use less paper, some teachers have utilized Twitter to link important documents, such as parent letters, pertinent assignments, homework, and classroom expectations. I’ve had great success using Twitter to communicate to my stakeholders. 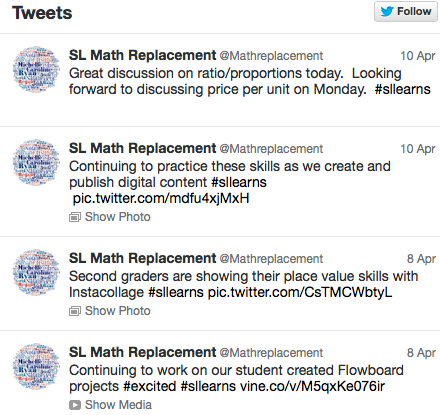 Having a classroom Twitter account can also help engage your parents in using social media. Twitter also allows two way communication, as parents can send direct messages or Tweets back to the teacher. If you were ever wondering how to use Twitter in your classroom, visit Lee Crocket’s 60 ways to use Twitter in the classroom. I should also mention that by setting up your own Twitter account you can also use Twitpic and Vine, which I mention below. Twitpic: A picture is worth a thousand words, right? Whether you agree or disagree, Twitpic can illustrate what’s happening in the classroom. Twitpic can also be connected to your classroom/school Twitter account. Classroom activities and discussions can be documented with the Twitpic app. A teacher can take a photo with the app and automatically upload it to their classroom Twitter account. I’ve found that embedding your Twitpic pictures on a class webpage can look like an ever-changing photo gallery of your classroom. Parents are able to view the gallery of pictures any time they visit your classroom webpage. This encourages engagement at home and gives students an opportunity to verbally construct a caption for their parents. Vine: If a picture is worth a thousand words, what’s a six second video worth? Some would call Vine a video recording device, but I use it as a communication device. Vine can connect to your classroom Twitter account. When parents click on the Twitter Vine link, a new page will pop out that displays the video. Here’s an article that shows a few different ways to use Vine in the classroom. I’ve used Vine to show how students use math manipulatives, present projects, work collaboratively, classroom arrangements, iPad usage, and many more activities in the classroom. There are many different ways to communicate all the great things that are happening in your classroom. I just emphasized three in this blog post. What are you favorites? I’ve observed and participated in a number of Twitter chats this year. To be honest, I’ve expected a conversation with individuals who may be part of a PLN that are willing to express their perspectives on education. Scheduled chats generally have moderators and participants are free to express their opinions and may even ask questions aligned with the topic. Constructive debate is sometimes encouraged as educators often question the norm (or are at least not satisfied with the status quo). At times, resources might be shared and links bookmarked. While contributing, I share background knowledge and resources that have improved my teaching practice. Generally I come away from the chat with additional resources and ideas that I can practically utilize in the classroom. My latest Twitter experience at #elemchat followed the above process, yet challenged participants to take purposeful action after the chat. The topic during this specific night was about social bookmarking. The moderators did a fine job asking questions and guiding the discussion accordingly. Background knowledge was expressed by individuals who have had experience using social bookmarks. Social bookmarking links and student examples were shared during the chat. Diigo, Delicious, Symballo, Google and Scoop bookmarks (there may have been more, but I’d have to look at the transcript) were all discussed and analyzed during the chat. In my opinion, what was said above is intriguing. Gaining a better understanding of how to practically apply social bookmarking was one of the purposes of the chat. Not only were participants gaining knowledge, but they were able to find ways to apply learning to improve their own practice. Approximately half way through the chat, one participant thought that an#elemchat bookmarking site should be created. Another participant created the bookmark on Diigo and since it’s been created a number of people have added valuable resources that educators can utilize to improve student learning. My latest chat gave me a sense of how a scheduled chat can transform into a professional development opportunity. Administrators and educators alike can see the value of Twitter chats. If you’re on the fence and wondering if an educational chat is actually worth the time and effort, I would recommend getting your feet wet and become an active participant.